Hi everyone! 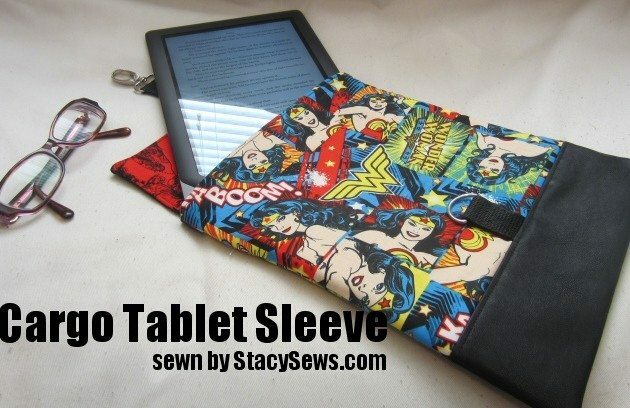 It’s Stacy from StacySews again. 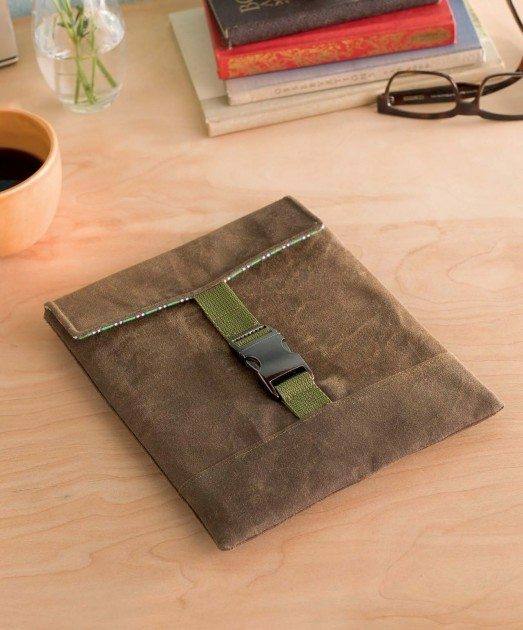 This week, I’m getting ready for back-to-school by sewing up the perfect project for just about everyone in the family – The Cargo Tablet Sleeve from Betz’s book, Present Perfect. 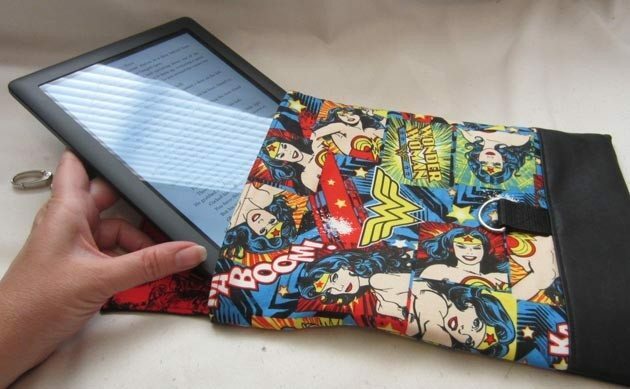 When I went looking for fabric for this project, I stumbled across some quilting weight material and fell in love with it… not only am I a HUGE Wonder Woman fan, I have a soft spot for novelty prints. Since the instructions for the Cargo Tablet Sleeve calls for canvas, I knew that this cotton print wouldn’t be heavy enough, so I added a bit of extra interfacing to my cart to ‘beef up’ my material to make it more suitable for this project. When compared to canvas, quilting weight cottons are much thinner and have more drape. However, that doesn’t necessarily mean that lighter weight fabrics can’t be used, they just need more body added to them. Heavy weight stablizers, layers of woven interfacing, and even the super-stiff interfacings such as Peltex or Timtex can be added to cottons to give them more body – how much is dependent on the material weight needed, the firmness desired, if your project is needing to stand on it’s own, and personal preference. While a heavy weight stabilizer would work fine in this case, I went with fusing two layers of woven interfacing to the wrong side of my fabrics – this method made the fabric very close to the weight of canvas and is a dream to sew on. 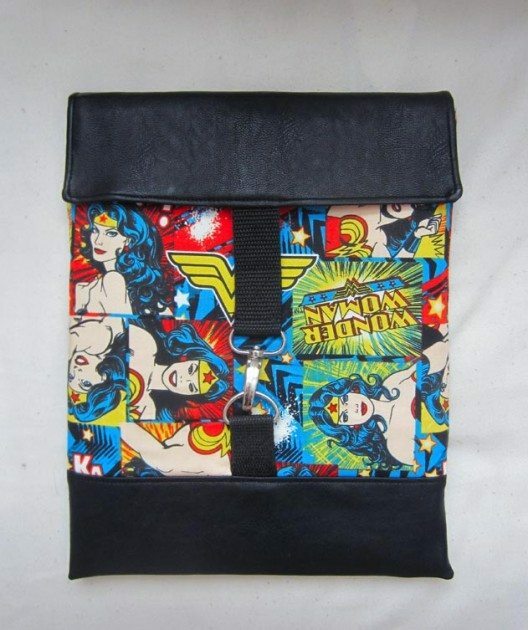 I also opted to add leather accents to the flap and lower sleeve panels because it is much more durable material and might wear better in backpacks and bags than cotton fabric alone. Even with the change in material that I made, sewing this project up was quick and easy… which means that I can easily whip one up for every member of my family over the weekend (because this one is definitely mine)! Even though we all have different tablet brands the size of the Cargo Table sleeve fits all of them perfectly and has just enough padding to keep them safe. Best of all? No one can ever grab the wrong case because I plan on making sleeves that are uniquely different and expresses their personalities perfectly! This post is part of the Betz White Sewing Collective series. Content is written by compensated contributors expressing their own views and opinions. I LOVE it! 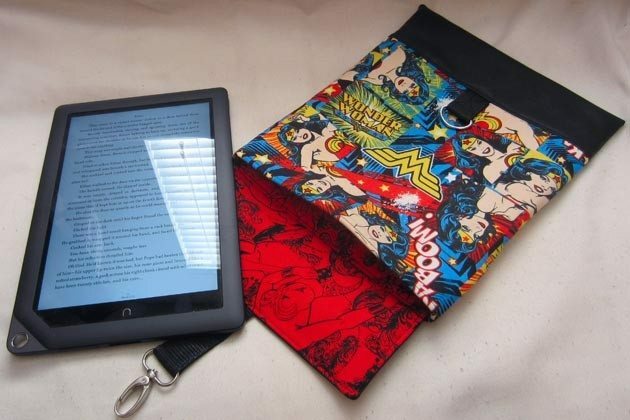 WHERE did you find Wonder Woman fabric???!! Stacy tells me she got it from Fabric.com, the collection is called Girl Power 2!